For those of us unable to attend New York Comic Con this weekend, Bottleneck Gallery has a little something special for us! That’s because they’re releasing three of their New York Comic Con 2018 exclusives online, including this awesome Batman Beyond Rebirth #1 screen print by Martin Ansin. This design was the original cover artwork to Batman Beyond Rebirth #1, but it works even better as a large scale art print. Ansin did an amazing job with Terry McGinnis’ Caped Crusader. 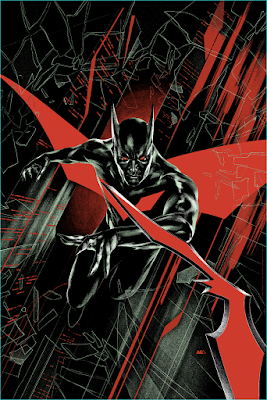 The New York Comic Con 2018 Exclusive Batman Beyond Rebirth #1 Cover by Martin Ansin is a 24”x36” hand numbered screen print. Limited to just 225 pieces, collectors can purchase it at 12pm EDT today, Wednesday, October 3rd, at the Bottleneck Gallery online store for $50.